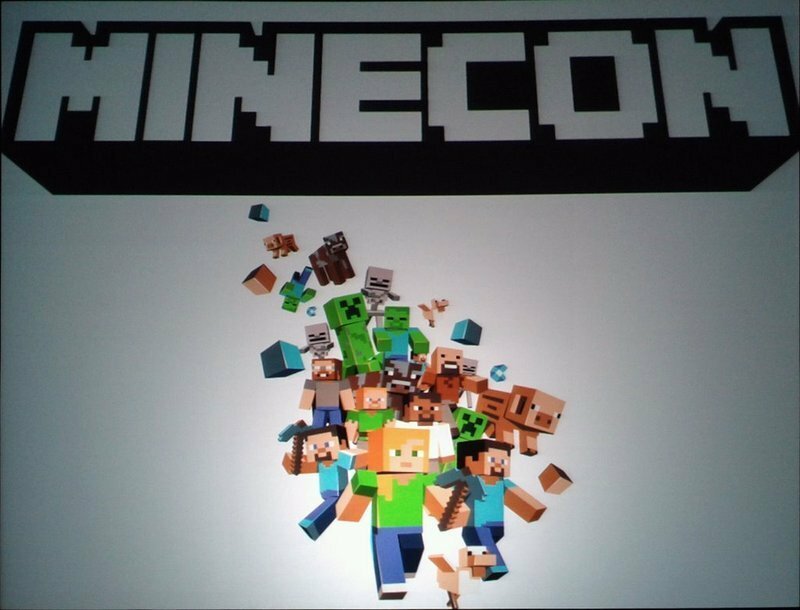 Minecon, Mojang's first conference for Minecraft fans, was a big success. I was amazed that 5,000 people (the con sold out) from 20+ countries made the trip to Las Vegas to spend two days immersed in their favorite game. 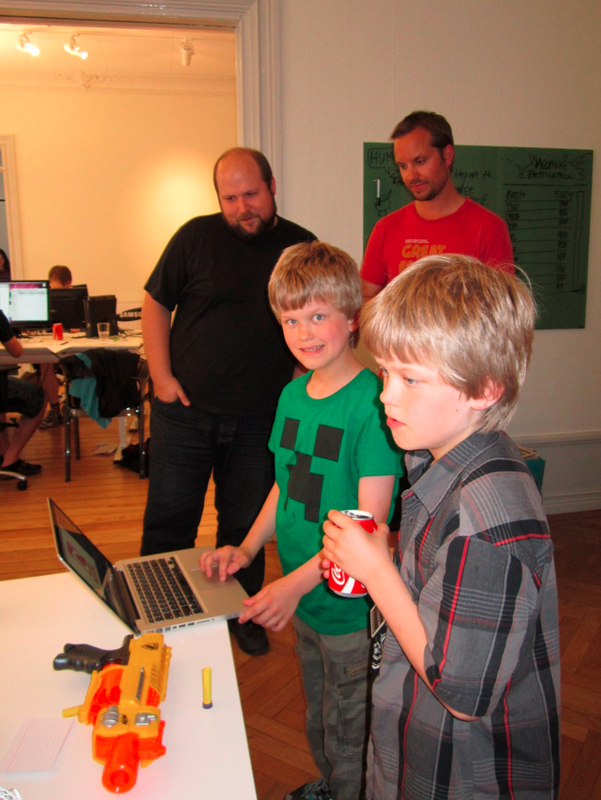 Our three sons love Minecraft and, even though they'd visited Mojang in Sweden this summer, they were very eager to attend Minecon. I could go on about the many things we liked: The people we met, the costumes, the sculptures, some of the talks, how friendly the Mojang folks were. By now you've probably already read many reviews describing what a hit it was (like this one). Better Breakouts: My #1 issue. Some were great, but many consisted of people with no presentations and little to say. Gaming Opportunities: Set up servers so people can game together. I have a vision of large round tables, each with a server and a volunteer moderator. Some tables could have goals (building, exploring, etc.). Sit down, plug in, make friends, and play! Minecraft Clinics: Many of us are comfortable installing mods and hacking Minecraft but even more people (often bewildered parents) aren't. Set up volunteer run "Crafting Bars" (like Apple's Genius Bars) to teach people the basics of modding, customizing your skin, using a texture pack, etc. Minecraft Videos: Set one large room aside for watching Minecraft videos. Find the highest rated on Youtube, put them back to back, project on a large screen with good sound system, provide chairs for people to sit down, relax, and enjoy. Parents of a Feather. I loved seeing how many parents had brought their kids to Minecon. An opportunity for them to meet and engage on topics such as education, gaming with your kids, etc. would have been great. Oh yes... While it made perfect sense this time, in future please don't release a new version of minecraft at the conference. Give mod writers time to adapt their mods prior to the con. 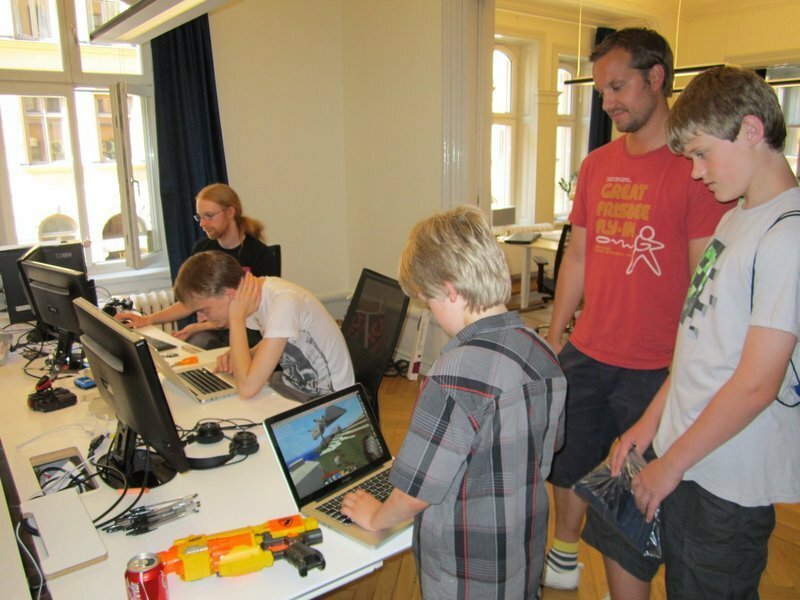 Visiting Mojang is no easy thing: these guys are extremely busy and well, they're in Sweden while we live in California. The geographic challenge was overcome when my wife Katrine took our sons to Norway to visit relatives. Stockholm, home of Mojang, is but a 6 hour train ride from Oslo. 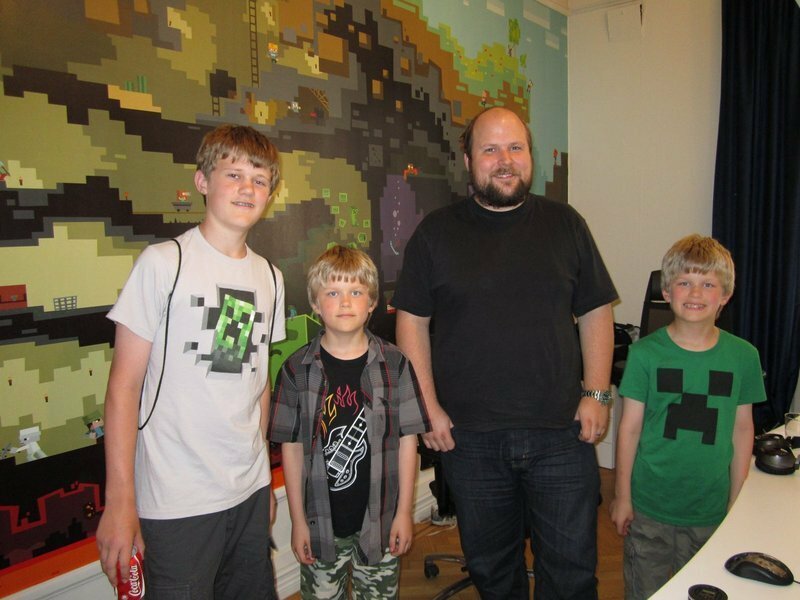 As they so wanted to visit their Minecraft Heroes, the boys sent personal letters to Notch to accompany the Minecraft newsletters they had created as homeschooling projects. I followed up with a phone call and emails to Carl, the CEO. He invited us to visit on one of their gaming Fridays. He emailed me the code that opened the door to get in the building, that was pretty cool! 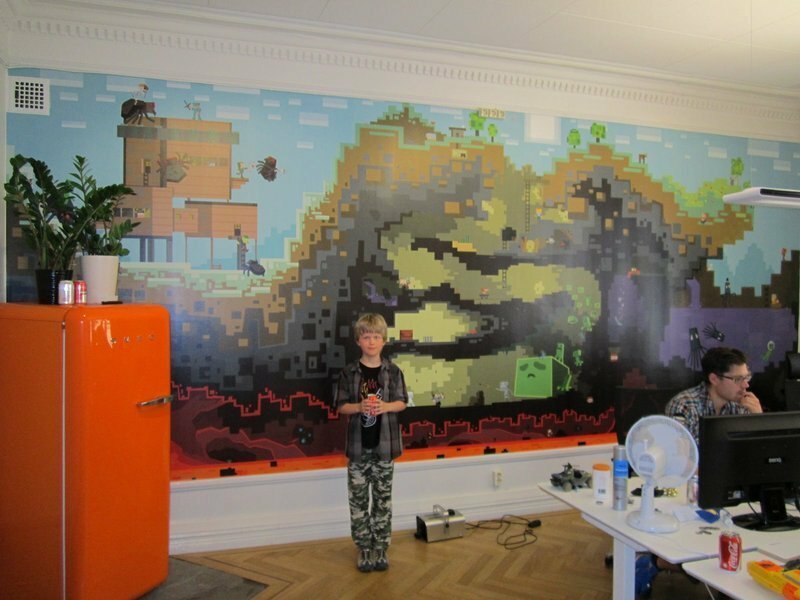 Carl showed us all around the Mojang office, we met the Scrolls crew in a separate area where we couldn't take pictures, and other Mojang'ers with Notch in another room decorated with the soon-for-sale wallpaper. They made us feel really welcome and special, and even though Carl was going on vacation the next day, he had time to show us around, talk to us and introduce us to his colleagues. He invited us to play games in the orange game room, and just hang out as long as we wanted. Daniel shows Notch and Carl the winged chest plate mod he & I coded together in Java (lets you fly by jumping and fall to the ground like a feather). Alexander shows Carl some of his Minecraft constructions.